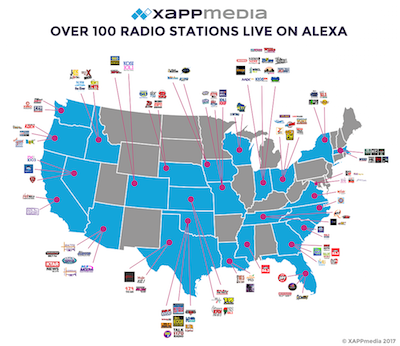 XAPPmedia announced that in less than six months, it has deployed live Alexa voice skills for 119 radio stations. These custom commands allow quick, direct access to the stations on the Amazon Echo suite of home speakers and other technology using the Alexa system. XAPPmedia’s station clients are located in 26 states and the District of Columbia. Its interactive voice platform includes skills for podcasts, on-demand listening, and customized day-parted welcome messages.